Don't you hate it when you make mistakes and have to unpick? I was merrily chugging along on the Gingerbread Bakery when I realised that I'd made one panel 2 threads too short. Normally I wouldn't worry about being out slightly if the pattern still looked OK, but these pieces need to be perfect in size, because they will eventually be sewn together. I went back and unpicked the beading, grass and base of one panel, and moved them all down two threads. Silk thread doesn't unpick well, so I had to throw away the thread I'd used for the grass. Now I may not have enough of that variegated thread to finish all 7 sides of the bakery in the same thread. I've had a look through my collection of threads and have found something similar so it will have to do. I can see how my error came about. In the above photo parts of the roof and higher than others, so I thought that meant some sides must be higher than others, but it doesn't. The differences in the roof height are totally due to differences in the roof panels. Anyway, I'm back on track now with only 2 panels left to complete. I will easily finish before the end of May. 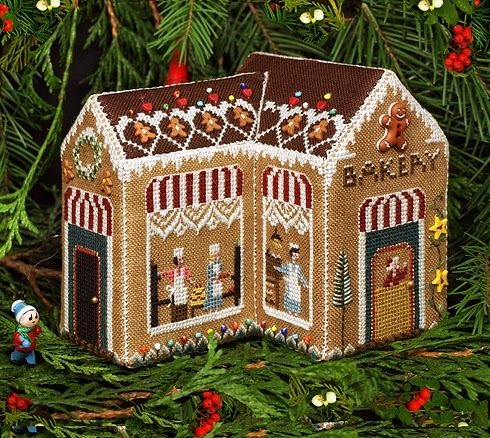 Then I can assemble both the Gingerbread Bakery and Candy Cane Cottage during June. Some people in this part of the world have a mid winter Christmas celebration on 25 June. Maybe I'll have to do that as an excuse to bring out my Gingerbread Village! Gorgeous! What a work of patience! When I make a mistake and know that I should undo it, but not want to, I live a dreadful moment. Do I unravel? Do I live with the mistake? For this gingerbread house, the unpicking was a necessity. But worth it as I'm sure the house will become a treasure. What a beautiful project. I don't have the patience for something like that, so I love to see what other people do. I don't have words. You are an amazing person to attempt this. I've been cross stitching for 19 years (though not dedicated, since I only have 1 finished project), and I'm not sure I would attempt this. Though I really want to - It's going to turn out so cute!! !